Pre-heat your grill to high heat (about 450°F). In a large mixing bowl, combine the first seven ingredients. Mix until all ingredients are evenly dispersed. 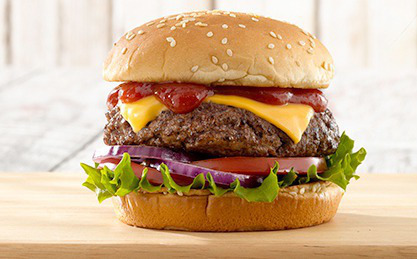 Take the burger meat and shape four 1" inch thick burgers. Place burgers on a preheated grill and cook for about 2-3 minutes on each side. Move burgers to a warm section of the grill and continue to cook for about 6-7 minutes. Burgers should reach an internal temperature of 165°F as measured by a thermometer. Top burgers with desired cheese. Place buns on the grill to toast for about 45 seconds-1 minute. Caution: buns will quickly burn. Assemble burger to your liking! Try this recipe topped with the H.J. Burger Sauce (see recipe) and grilled onions!